The world has gone into conspiracy overdrive over the past week, with new, ‘mysterious’ pictures of Melania Trump sparking one of the most out-there theories of 2017. In an internet world where sharks get picked up by hurricanes and swim through the streets, I’m making a bold statement there! 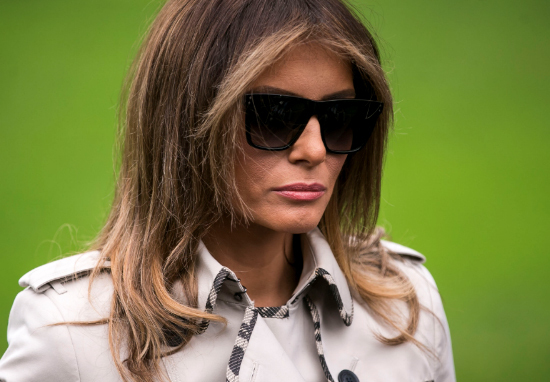 The First Lady was papped wearing large dark sunglasses and a ‘spy-like’ jacket as she accompanied her husband – President Trump – as he prepared to visit a Secret Service facility last Friday. My wife Melania, who happens to be right here, finds that subject to be of such vital importance, she’s very much involved. However, people were having none of it, and Twitter promptly went berserk with many believing Melania definitely had a body double. This is not Melania. To think they would go this far and try and make us think it’s her on TV is mind blowing. Makes me wonder what else is a lie. Joe’s theory was retweeted over 70,000 times and the ‘evidence’ began to snowball. Some people noted how her facial structure looked ‘off’, while others fixated on the unusually ‘awful condition’ of her hair. That's what I thought! The hair is in awful condition (or it's a really bad wig) and she'd never let hers get that way. The Donald won't allow it! The nose looks like it's attached to the sunglasses, is anyone else seeing that? ?? It wasn’t just her appearance which aroused suspicions. Many people were left spooked by her uncharacteristic mannerisms, which included being more ‘animated’ and nodding more. Pictures of Melania without sunglasses at the facility later on the same day further fanned the flames. she never nods when Donald talks, this is a fake melania. What's going on? Is she refusing to participate? Never seen her that animated before- v suspicious! However, this Twilight Zone-esque rumour could well be traced back to a light-hearted tweet by journalist Marina Hyde, who tweeted a few days before Joe Vargas did. Absolutely convinced Melania is being played by a Melania impersonator these days. Imagine my pride to find that by Thursday morning, this cobblers had percolated all the way up to news Valhalla – AKA sections on Good Morning Britain and Sky News – having been fanned by various nutjob social media accounts in the US. Furthermore, it had been smartened up for appearance in the Washington Post and USA Today and so on. Well, now. To be honest, I had feared the process of creating conspiracy-based fake news would be a lot more inconvenient – I was concerned I’d have to go to that Macedonian town and hang out with the emo teens or whoever it was whose fake news farm skewed the US election for the Russkies. But I needn’t have worried. It turned out to be something I could do in a few moments while exiting South Kensington tube station. So be careful next time you tweet something funny on the way home from work.